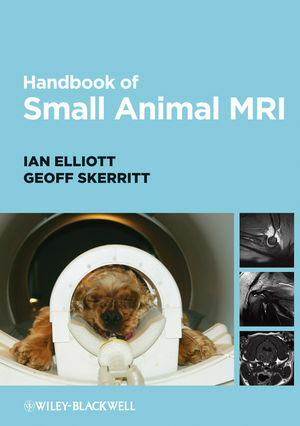 Handbook of Small Animal MRI will help you make the most of one of the greatest advancements in veterinary practice in recent years, magnetic resonance imaging. Those using the services of mobile scanners dedicated to veterinary use, as well as those in practices with their own MRI machine, will benefit from this book. It provides a clear and comprehensive account of how this important diagnostic tool works. In addition this easy reference handbook provides guidance on the interpretation of images of common clinical conditions. Written by two pioneering experts in the field with a combined experience of over 20,000 MRI studies of veterinary patients. Suitable for small animal veterinarians and veterinary students. Ian Elliott trained as a Radiographer and first became involved with MRI in late 1980s. He has worked exclusively in MRI since 1991 and, following an extensive spell scanning human patients, helped pioneer the use of the technique in veterinary practice. Ian has been involved exclusively in veterinary MRI since 2000 and has scanned many thousands of cases during this time. He currently works for Burgess Diagnostics providing MRI services to veterinary surgeons throughout UK and Ireland. Geoff Skerritt is an RCVS Recognised Specialist in Veterinary Neurology, Diplomate of the European College of Veterinary Neurology and former President of the ECVN. In 1997 Geoff was one of the founders of VetMRI, the first mobile veterinary MRI facility in Europe. He is the founder and director of ChesterGates Animal Referral Hospital, a leading multi-discipline veterinary referral centre in the UK.